During the holiday season, I try working on the go quite a bit. While I love working on my tablet and browsing the internet, I found that I just can’t work on the blog or anything that takes quite a bit of typing without a keyboard. For this reason, I usually try keeping a wireless keyboard with me whenever I’m planning on working on the go. The problem with many wireless keyboards, however, is that they are bulky, heavy, and sometimes even noisy. When I’m working on the go, the last thing I want to do is bother others, so a quiet keyboard is a must. Recently, I found what may be the perfect keyboard for my travel situation – the Inateck Bluetooth 3.0 Ultra Slim Keyboard! 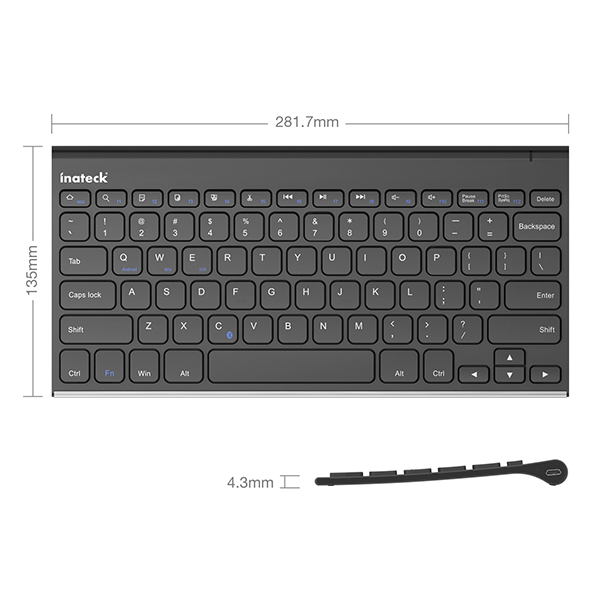 Inateck Bluetooth 3.0 Ultra Slim Keyboard: What is It? Looking for a high quality, but inexpensive Bluetooth keyboard that is perfect for anyone constantly on the go? If so, we think you will love the Inateck Bluetooth 3.0 Ultra Slim Keyboard. This innovative keyboard is lightweight, thin, and designed to easily pair with most Bluetooth devices. With 3.0 wireless technology, it is able to transmit at speeds up to 24 MB – 8 times faster than Bluetooth 2.0! The keys themselves are also relatively quiet and designed to be as comfortable as possible while typing, making working on your tablet even easier! We found that this is so far a great keyboard for anyone looking for a an easy to use, quite wireless keyboard that doesn’t take up much space. For people like me who love using their tablet for just about everything, this little keyboard is great for working on the go. It is light and small enough to easily fit in my larger purses with my iPad. With the easy pairing and its responsiveness, we consider it an obvious choice for anyone looking for a wireless keyboard. Based on our own experience, we are happy to give the Inateck Bluetooth 3.0 Ultra Slim Keyboard an A rating. Want to purchase this wireless keyboard for yourself or someone in your family? 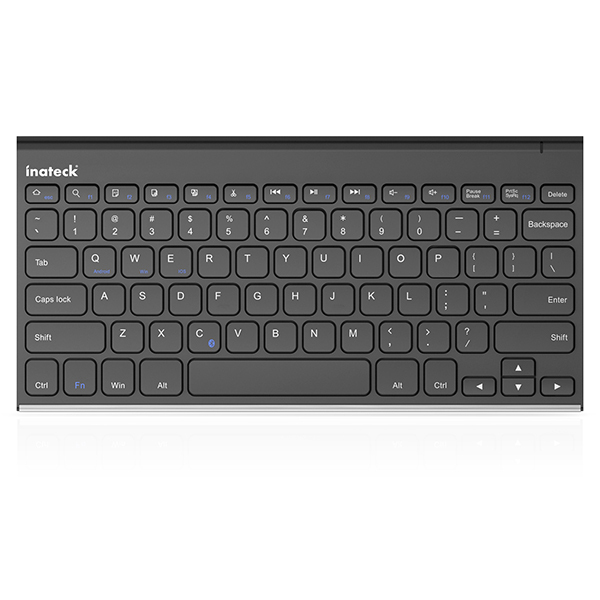 You can buy the Inateck Bluetooth 3.0 Ultra Slim Keyboard on Amazon.com for only $21.99. Would you like to win this awesome keyboard for yourself or someone in your family? We are excited to be working with Innateck on this awesome giveaway! One very lucky reader will win a Bluetooth 3.0 Ultra Slim Keyboard! To learn more, make sure to read the rules below and then enter through the Rafflecopter! One lucky reader will win a Inateck Bluetooth 3.0 Ultra Slim Keyboard. I would like to win because my Keyboard mess up hang up capital lock hangs up.this Inateck Bluetooth 3.0 Ultra Slim Keyboard would be perfect for me and it’s wireless. I’m really in the market for my first tablet in the new year but I’m a touch typist and can’t imagine not having a full size keyboard. This one looks great and practical. i need to win this giveaway because i love wireless keyboards how they function and i have been looking for a good wireless keyboard and could not find a good reciew of it and now since i know inateck has a great wireless keyboard and its feautres are awesome so i would like to win it. I would love to win this for my son; he would LOVE it! I want to win because my sons constantly get crumbs in my keyboard. this will give them their own to use. This keyboard will allow me to not be right at my computer when using it since I already have a wireless mouse. Sometimes I don’t feel good enough to be sitting for hours at my computer desk and this keyboard will allow me to take a break while still getting my work accomplished. i NEVER sit at my desk in my home office – I am always on the couch. i also sit in bed using my ipad going over my etsy page as well as to answer email so this would be awesome!! i am in the middle of creating a crafting room so i will be moving back and forth from table to desk in that room. I would love to win this! When I type by touchpad I always mess up because I have big sausage fingers lololol! Leave a comment telling us why you want to win! Your comment needs to be at least 2 sentences. I’d like to win because my sister gave me her old tablet, but the screen is so small it’s hard for me to type on it with my big ole fingers. I’d like to win because my sister gave me her old tablet, but the screen is so small it’s hard for me to type on it with my big ole fingers. I make a lot of mistakes and it takes me a long time to get anything typed. I’ve been in the market for a great wireless keyboard. This one seems to have all the specs that I’d need, and it looks nice too! 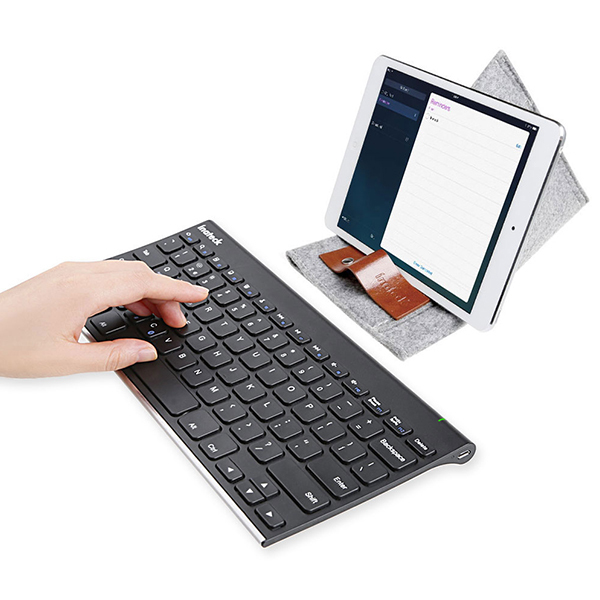 I would like to win this keyboard because it would work really well with my tablet and with a Bluetooth adapter, with my Raspberry Pi computer too. This would be great for my laptop. It would make typing a lot easier. I would love to win this for my son. He needs a good one for his laptop. I want to win this because my ipad is nifty but I am not too fond of the whole touch screen for EVERYTHING !!!! Its maddening , lol ,very frustrating ! I’d love to win this keyboard because I have two tablets and it’s really hard to type on their tiny virtual keyboards! Thanks for the chance! I would like to win because I just picked up a new tablet for my daughter. Adding a keyboard would make it much easier to type documents, e-mails, etc. I really need a new computer!! I get frustrated by how slow it is, and this new one would be a perfect fit for me. i would love to win this so i could give as a gift to my boyfriend. He loves to fix computers and give them to people who need them. he is so nice to so many people. so i would give to him so he could have an extra to pass on. I work from home a lot, but I only have a laptop. This would be perfect to connect and make work easier. I’d love to win this ultra slim keyboard for my mother. She works on her kindle a lot and sometimes it can be hard to write emails with the on screen touch keyboard. I’ve had other wireless keyboards in the past. I think, perhaps, I jumped in too soon because I never really liked them much. This model, though, is slick. I would like to win this keyboard as I’m always on the go. I think this would be perfect for traveling for the slim nd bluetooth capabilities. Hi, I have been trying every day for a week to pin your image on Pinterest. I get this message every time We’re having some trouble talking to http://www.budgetearth.com. Please try again later! I don’t know if anybody else is having this issue. I thought you would like to know. I have a laptop but want to get a table top computer and this would be the perfect size. Love it has bluetooth and is quiet. My daughter works from home and she has a table top and could also use this ultra wireless keyboard. This is a great invention. I want to win because I need a new keyboard. This one is perfect. I would love to win this because the keyboard is wireless to begin with. And I have a few keys on my laptop that stick and drive me nuts. I would like to win because my daughter just got a tablet and this would be great for her. She would learn to type. I want to win this because it would be the perfect addition to my small office at home. I love the sleek design and I like that it’s wireless. I purchased our first tablet for my husband for Christmas this year but neglected to consider a keyboard. This would be the perfect accessory to go with his tablet. I would love to win this for my son. He is in college and I think this would be great for him to use with his tablet. I’d love to win this so I could give it to my mom. I bought her a tablet for Mother’s Day, and while she loves it, she hates trying to type on the screen.